A powerful daughter figure needs saving from an entourage of black-draped specter horsemen. Dangerous supernatural powers are at risk of falling into their malevolent hands, and I’m meant to stop that catastrophe. There’s an overwhelming sense of urgency, but there I am, basically tying off sacks for peasants. It happened like this: early in The Witcher 3 I was tasked with finding a witch. The witch lived in a nearby waterside cottage and was reported to have details on the whereabouts of aforementioned daughter figure. I was determined to speak to her immediately. My cause was urgent, after all. I’m Geralt of Rivia, scorned Witcher, master swordsman, and I have no time for nonsense. On my way to the witch I stumbled upon a typically destitute Velen village. I didn’t care about the village at all, and I wasn’t drawn to its armories or tradesmen. But something—maybe the sun setting so amber on the horizon, or the children dashing frantically through the muddy streets—made me stop. I was curious. It probably goes without saying, but if you’re in a hurry, never get off your horse enroute in an open world RPG. This is especially true for The Witcher 3. Several hours later, once I’d cleared out some monsters for a desperate peasant in her far-off stable, and made preliminary moves to slay a beast haunting the town, I forced myself to leave. Turns out the witch was only 50 metres North all along. I didn’t really want to leave, though. It’s not that I liked the town, and it’s not that I savoured the fantasy of being a hero to its people. It’s certainly not because I wanted to tick off this town’s quests (there are so many quests, there’s no point being thorough). I was just curious about the villagers’ circumstances. I’d gotten to know the town, but I didn’t understand it. How did they get so poor and wretched? Am I complicit, thanks to my (reluctant) connection with the Nilfgaardians? Is it the climate? Or is it just the way they’ve always lived? Straight up, this is the most remarkable thing about The Witcher 3. Its writing isn’t perfect—it still bears some of the familiar trappings of being a video game—but it almost always rewards curiosity, big time. The rewards for wondering are invariably bleak, but The Witcher 3 achieves something very few video games do: when I’m engaged in a peripheral mini-narrative I’m not necessarily thinking about its game aspects. I’m not thinking about the XP rewarded, or the money I’ll get, or the allegiances I’ll forge, or the buffs I’ll unlock. I’m not grinding. I just really want to know, and understand, what’s going on. Geralt’s cause may seem urgent, but the worst way to play The Witcher 3 is quickly. In this game, distractions overwhelm you. For mine, the game’s distractions are where its most engaging stories are found. Geralt is the hero. He’s a gruff, powerful, chiselled, archetypal male video game protagonist. Early on, The Witcher 3 has him exploring the Northern Realms, recently taken over by the warmongering Nilfgaardian Empire, for women he’s either a) in love with or b) eager to protect. He kills monsters, beasts and bandits along the way. He’s recalcitrant in the face of royal authority. He lets his beard grow. He’s tough. I didn’t like Geralt before I started playing The Witcher games. I’d see his face on marketing material and smirk: he was just another by-the-numbers video game power fantasy. It’s not that this fantasy is thoroughly objectionable to me, but it definitely seemed as if Geralt of Rivia was a boring video game tough guy. A cliche. The truth is, he’s only the video game tough guy cliche you make him. Geralt has his complexities, but he inherits them from you. He’s a malleable character, and I feel more connected to him than I do the thoroughly customised RPG characters in Skyrim. His wit, his ingrained prejudices and allegiances, are just subtle enough that they don’t impinge on my ultimate control of who he is. Before I get to the finer details, here are the cliffnotes: Geralt is tasked with finding the daughter of Emhyr var Emreis, Nilfgaard’s emperor. The Nilfgaardians have taken, by force, most of the regions you’ll visit in The Witcher 3. It’s not immediately obvious whether they’re a force for good or bad (especially if you’ve never played a Witcher game before), but one thing is certain: nothing is going well. The people in The Northern Realms are miserable. There’s the weak and the strong, and no grey area in between. Poverty is everywhere: alcoholism, boredom, listlessness. Nothing is going to be OK, but evidence suggests it was never OK to begin with, Nilfgaardians or not. Matters are complicated by the fact that said Nilfgaardian leader’s daughter, Ciri, is someone dear to Geralt, and that a dark force–the Wild Hunt–is pursuing her. The official mission only lends a wider context to a more personal endeavour on Geralt’s part, as this was a woman he’d trained from a young age, and accepted as a daughter. Ciri is a central character, and she's even playable in certain linear sequences. In true sprawling RPG fashion, that’s not all that The WItcher 3 is about: finding Ciri isn’t the crux of the game’s narrative. Other power struggles come into play later on, and then some other stuff happens, and then… the whole world is at stake and you’re the one to save it. It’s a fantasy RPG, after all, and while the ending is typically grandiose and heartstopping, the main thread would feel a bit rote without its minor story arcs. You won’t care so much that the world is at stake unless you’ve made the effort to learn a bit about it via sidequests. And while newcomers won’t feel punished for skipping the first two games, they’ll miss the rewarding familiarity of old characters and references. To accommodate new players, dialogue options are sprinkled with opportunities to gain background information on plotlines involving historical events. You’ll usually have a handful of main quests in your log, as well as potentially dozens of secondary ones, as well as Witcher contracts (fully fledged, investigation-led monster-slaying jaunts), and each is complemented with cutscenes. Certain secondary quests appear to affect the main narrative proper, and CD Projekt RED has done an admirable job blurring the lines between primary and secondary. Everything in The Witcher 3 feels big: the dungeons are huge and sprawling, the decisions immeasurably consequential, the moral responsibility through the roof. Truth of the matter is that the best stories you’ll take away from The Witcher 3 are peripheral to the main narrative. This is for two reasons: while Geralt is a character that you can’t aesthetically customise to any satisfying degree (you can’t deck him out in mage gowns), you can really make him yours thanks to a nuanced and consequential dialogue system. The second reason is more obvious: the Northern Realms is among the most lifelike, sadly beautiful and strange fantasy worlds ever committed to code, and you’ll want to pick it apart. You play a dual role as Geralt: steely, masculine protagonist on the one hand, and foolhardy, ignorant tourist on the other. As a Witcher, Geralt is armed with two swords and five magic abilities called Signs in addition to bombs, crossbows and other, more spoilery strategies. Combat in The Witcher 3 is simple: slash away at your foes, apply effects and buffs where necessary, roll or block to evade, and sprinkle in sign abilities where needed. These signs include a fiery blast, a telekinetic stun, an offensive shield, a mind control ability, and a static magic trap. While simple to learn, the combat system punishes mindless hacking and slashing against anything but low-level wolves and dogs. Geralt’s cumbersome gait, and your inability to break his animations, means close attention needs to be paid to most encounters. Like the Souls series, a defensive approach is important until you’ve sussed out the weaknesses of your opponent. Some will be resistant to your fire sign, so you may be better off equipping a protective shield, and so on. Overall, it’s satisfying to exercise caution and dexterity, especially at higher difficulty settings where you can’t just meditate to replenish Geralt’s health bar. During my first playthrough I felt that levelling Geralt was excruciatingly slow, but it happens at a fast clip if you know what you’re doing, and skill points can be acquired throughout the world without grinding. There are four main categories to sink levels into, and three have five deeper categories of their own. The problem, early on in the game, is knowing what to prioritise—especially since trees need to be equipped in one of a series of growing slots. I specialised in swordplay and Igni in the early hours (fast attacks and Geralt’s fire ability), but it’s possible to go more defensive. For example, levelling your mind control ability will influence dialogue options against non-aggressive characters. Despite being a Witcher, bandits still insist on roughing Geralt up. It doesn't end well for them. The biggest bone of contention is going to be the alchemy and crafting systems, which are incredibly detailed in The Witcher 3. Geralt finds alchemy blueprints regularly, but happening across the ingredients required to create them is slow unless you know where to look (and you won’t). Thing is, there are hundreds of ingredients, and The Northern Realms are huge. Once you’ve found the ingredients you’ll never need to acquire them again, but when it comes to upgrading armor and weapons it’s important to have a game plan, and it’s unwise to concentrate on improving the lowly weapons you’ll find early game, which are colour coded according to their power. While there’s nothing wrong with complex crafting systems, it’s not improved by The Witcher 3’s dense and sometimes tedious user interface. There’s evidence of console-centric design in the radial menus and keybinds (number buttons can switch between signs but won’t immediately cast them as in Witcher 2), but the inventory and character menus are clearly designed with PC in mind. That said, a few more categories would help: it’s only a matter of hours before your Usable Items and Ingredients tabs are swollen to the brim, with no rhyme or reason as to how items are sorted. Overall, the PC version still feels the best. The PC advantage is obvious when it comes to combat, which benefits from a mouse and keyboard. Due to Geralt’s syrupy movements the ability to more rapidly adjust the camera with the mouse is a saving grace, especially when the game’s lock-on system leaves a lot to be desired. It definitely locks on, but when it comes to scrolling through enemies on the battlefield it’s less than ideal. It’ll usually take a left-to-right approach, rather than a back-to-front approach, which doesn’t work well when you’ve got more than three enemies baying for your blood, and one right up in your face. Having personally played the game across two systems (a high-spec gaming laptop as well as a console build), I can confirm that fighting is much more enjoyable at 60 frames per second. It makes blocking and parrying a lot more readable against human characters, and a little bit of slowdown during evasive moves can prove an annoyance. There are two main regions in The Witcher 3: the aforementioned Velen and The Skellige Isles. There are a few smaller areas, but it’s in these main regions that the bulk of The Witcher 3 plays out. They’re big, of course, but that’s not what matters. The Northern Realms are the most vibrant video game locations I’ve ever seen: less cartoony and more detailed than Dragon Age: Inquisition, and more naturalistic—less uncanny, less janky—than Skyrim. But that’s not hugely important either. What’s important is that when all of the Witcher 3’s environmental elements work in concert—the weather you can forecast by looking at the sky, the foliage that rustles and bends in the breeze—it’s hard not to feel something. When the sun sets it appears to melt in a sea of apocalyptic orange, and you know what? It’s a beautiful, sad orange. The Northern Realms are engaging and lifelike, sure, but they convey melancholy unlike any other open world I’ve encountered. That melancholy extends to the people and situations Geralt encounters too. Witchers are scorned for being mutants and sub-humans, and they’re reputed to not feel anything. The thing is that I, the player, couldn’t help being affected, and while many of the dialogue decisions I made appeared to be morally-inclined, it was sometimes hard to make decisions along those lines without feeling like I’d done something wrong. This is a dark fantasy. It’s dark and horrible and oppressive. This can be alarming. There are some obscenely vicious characters in The Witcher 3 that you’re allowed to feel sympathy for. You might not, but the option is there, and that’s perilous territory for a video game. CD Projekt RED has approached this openness with as much sensitivity as possible, but in the end, it’s hard not to cringe in dismay when you’re given the option to sympathise with a domestically violent character. There are other minor issues with CD Projekt RED’s world-building. There are few fetch quests as such, but there are several occasions where you’ll go to talk to one character, who will advise you to go talk to another character, who will advise you to go seek out four other characters, and so on. In a 100+ hour game these moments barely make a dent, but they’re a clumsy way to present story in a narrative-driven RPG. As incentive to explore the world they don’t work, because there’s ample reason to explore anyway. Then there’s the investigation scenarios, where Geralt uses his Witcher sense to detect telltale signs in the environment. There’s little thought needed on the player’s part, as simply finding the objects will help Geralt deduce his next move. This works especially well in Geralt’s monster contract quests, but as part of grander narratives they could benefit from a little more depth. I’d have liked to be forced to use my brain a bit more. Meanwhile, The Witcher 3 doesn’t bring much that’s bracingly new to the modern RPG. It’s a series of refinements: the questing and attention to detail is better than Skyrim, the pervasive sense of dread is thicker than Fallout 3 and the decisions more impactful than Mass Effect 2. It relies on familiar gameplay beats to tell a story, but shows no evidence of wanting to experiment on a grander scale. I was never surprised by the game’s systems as much as I was intrigued by its setting. Comparing notes with my PC Gamer colleagues, the game ran well on a variety of configurations. Using an Intel i5-2500k processor and an Nvidia GTX 980 at 2560x1440, we were able to run everything on Ultra, barring HairWorks and Foliage Visibility Range, which we ran at High. The game operated comfortably at around 50 fps in 1440p, though with HairWorks on and Foliage set to Ultra, it dipped to 25-35 fps. Meanwhile, using an i7-5960x and Nvidia Titan X, we had no problem maintaining a consistent 60 fps at 1080p. Framerates tended to be more stable compared to another recent heavyhitter, GTA 5. Overall, on a two-year-old system 60 fps should be manageable with some settings adjustments, and while the game really sings at high-to-ultra settings in 1080p, the differences between those settings tend to be subtle. On a high-end laptop I only had framerate issues in specific locations around Velen, where unusually thick foliage and water effects culminated in drops to around the 45 fps mark. Compared to the PS4’s wavering 30 fps and frequent, pre-launch slow downs, it’s a huge improvement. 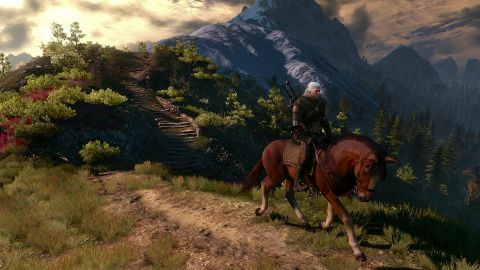 The Witcher 2 still has a reputation for pushing PC graphics to the limit, and while graphics in The Witcher 3 are undoubtedly impressive, it’s not the Crysis many expected it to be. The fidelity matters less here than the scale. As storms approach, and gales rustle and bend tree branches, and as the deers run for cover, it’s hard to dispute this is a gorgeous game. The lighting and weather effects are breathtaking. It’s difficult to resist stopping to stare into the distance. That's me, staring into the distance again. Still, on a granular scale it’s unlikely to endure as the graphical showpiece its predecessor was. You don’t have to look far to find low-quality textures. Foliage is thick and abundant, but leaves are flat 2D textures bisecting to create the illusion of 3D. Clothing still looks thick and lived-in, but not dramatically better than Witcher 2. Facial animations and non-mocapped character animations don’t push any new boundaries and occasionally look awkward or stiff. Skin pores and facial expressions are fine, but even mocapped faces lag behind the most impressive contemporary facial animation. These aren’t criticisms so much as observations that The Witcher 3 isn’t the great leap forward some might have hoped. Designing open worlds like this doesn’t come without compromises. It’s disappointing that it doesn’t live up to the potential showcased in the first trailers, but we can only enjoy what’s in front of us for what it is. It’s the storytelling and art direction that impresses more than the raw details, and these are the reasons The Witcher 3 consumed me. I felt more engaged with the Northern Realms than I ever did Skyrim, and even as the narrative advanced and tension mounted—and even when I felt I knew the lay of the land pretty well—I was still compelled to take it slowly and learn. For a game boasting all of the political treachery and turmoil common in the genre, The Witcher 3 succeeds because it puts people first. More compelling than Geralt’s lofty, heroic journey are the stories about the humdrum, circumstantial horrors of the helpless as they watch their world crumble. I’m looking forward to returning to The Northern Realms and visiting all of its villages and ruins. That’s where the heart of The Witcher 3 lies: not in its hero, but in the complicated world it brings to life.